Our Abpromise guarantee covers the use of ab6949 in the following tested applications. Both the heavy and light chains of Goat IgG are observed. Publishing research using ab6949? Please let us know so that we can cite the reference in this datasheet. 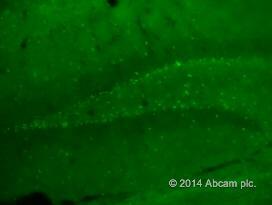 I used this secondary antibody on PFA-fixed frozen brain sections to bind to the primary antibody sox 2 (goat). We are interested in using your product cy3 conjugated goat IgG antibody (ab6949) for Western blots. Have you tried this product on Western blots and if so what dilution of product do you recommend? I'm not sure why you would want to use this secondary antibody conjugated to a fluorophore in Western Blotting. The secondary would bind to your goat primary, but you would not easily be able to detect it. I would definitely not recommend your using this antibody in WB. I would suggest a secondary conjugated to hrp followed by ECL.